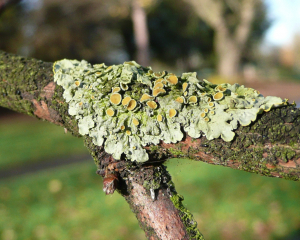 Observation - Xanthoria parietina - UK and Ireland. Description: Grey/pale green leaf like structure with orangey cups.Found on branch of small mature tree in lightly wooded park.About 3cm long, lots of other colonies on same tree found. Grey/pale green leaf like structure with orangey cups.Found on branch of small mature tree in lightly wooded park.About 3cm long, lots of other colonies on same tree found.